“This country’s being ripped apart here,” Flake told his fellow senators about the nomination fight. “I think we can have a short pause,” he added. “We ought to do what we can to make sure that we do all due diligence with a nomination this important,” Flake said. Even before Flake’s move, it was unclear if Republicans had the votes to confirm Kavanaugh on the Senate floor. Republicans hold a slim 51-49 majority in the Senate, making the votes of Murkowski and Collins crucial. Trump can afford to lose the vote of only one senator in his own party if all the Democrats vote against Kavanaugh and Vice President Mike Pence casts a tie-breaking vote. Trump said Murkowski and Collins must do what they think is right. Moderate Democrats Joe Manchin and Heidi Heitkamp, who have not yet announced how they will vote on Kavanaugh, also supported Flake’s move. Trump indicated he was sticking with Kavanaugh, saying he has not thought “even a little bit” about replacing him. With tempers flaring, the Judiciary Committee advanced the nomination 11-10 along party lines. The Senate formally moved to open debate on Kavanaugh’s nomination later on Friday in a move agreed to by both parties, setting the stage for a planned final vote on confirmation at the end of next week. “This is a nomination that deserves to move forward,” Senate Majority Leader Mitch McConnell said. 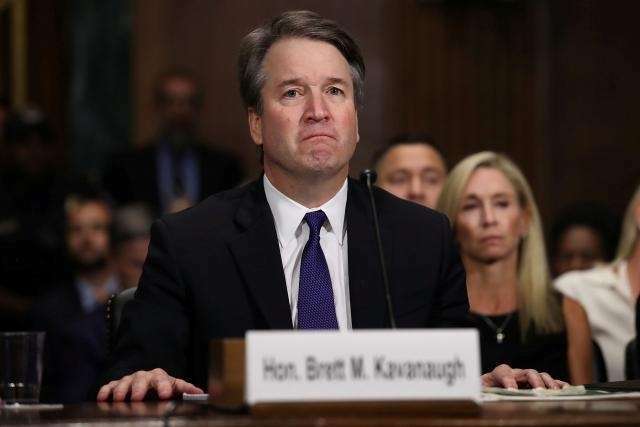 Ford’s lawyer, Debra Katz, welcomed the FBI investigation and thanked the senators who pushed for it but decried the limits imposed on it. “A thorough FBI investigation is critical to developing all the relevant facts,” Katz said. Before Flake’s move, committee Republicans voted down a Democratic motion seeking to subpoena Mark Judge, a Kavanaugh friend who Ford said witnessed the assault. Judge had told the committee in a written statement he does not recall any such incident. He is likely to be central to any FBI probe. Judge’s lawyer said he would cooperate with the FBI or any other law enforcement agency. Senator Dianne Feinstein, the committee’s senior Democrat, called Kavanaugh’s testimony unseemly for a judicial nominee. “This was someone who was aggressive and belligerent. I have never seen someone who wants to be elevated to the highest court in the country behave in that manner. In stark contrast, the person who testified yesterday and demonstrated a balanced temperament was Dr. Ford,” Feinstein said.